This is cross posted on Reads 4 Tweens. Carrie Harris is writing a novel for the Young Centurions series for Evil Hat Productions. It’s in the same universe as Dinocalypse Now, Beyond Dinocalypse, and King Khan, but the target audience is explicitly younger readers. Now, I’m all excited about this for lots of reasons. This novel stars Sally Slick at age 14 with her friend Jet Black. You get to see their friendship in its early stages. 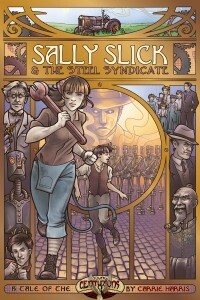 My daughter loves Sally Slick and can’t wait to read a novel that focuses primarily on her. My son loves the Spirit of the Century universe, and what with the racing tractors and robots and stuff, he’s going to love this book. How do I know? Because I’m the editor! I’m getting an early peek at a wonderful book. Working with Carrie is a joy, and this novel is going to be great. Prefer to judge a book by its cover? You’re in luck! The cover by the incomparable Dani Kaulakis was officially revealed and it’s amazing. 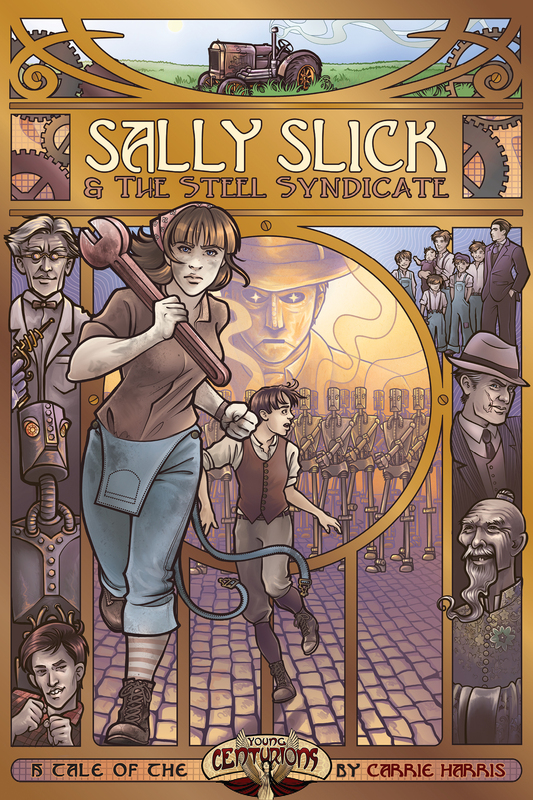 Sally Slick and the Steel Syndicate will be available in December. I know I’m kind of biased, but it’s a fantastically fun novel and I can’t wait for you to read it. This entry was posted in Books, Editing. Bookmark the permalink. I love the nouveau vibe of the art! Kaulakis does fantastic work.